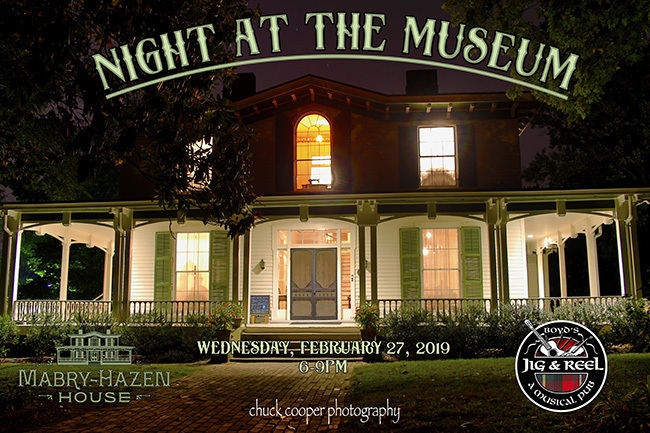 Mabry-Hazen House will host its quarterly after-hours social - Night at the Museum - on Wednesday, February 27, 2019 from 6pm-9pm. During the work week, museums (including Mabry-Hazen House) mostly keep bankers' hours and weekends are often packed with other activities, making it difficult for people who hold day jobs but would like to visit more often. Night at the Museum is a chance to visit Mabry-Hazen House after-hours on a weekday and drink up a little history. Explore the 1858 historic house in an entirely different light as twilight falls upon Mabry’s Hill, watch the sun set behind Sharp’s Ridge and North Knoxville flicker alight, all while enjoying drinks provided by Boyd’s Jig & Reel. Food will be available for purchase. All proceeds benefit Mabry-Hazen House. The event will occur rain or shine. Tickets will be available at the door or at www.mabryhazen.com/natm. More information is available at www.mabryhazen.com.